Drought is a natural climatic condition which occurs in virtually all climates, the consequence of a natural reduction in the amount of precipitation experienced over a long period of time, usually a season or more in length. High temperatures, prolonged winds, and low relative humidity can exacerbate the severity of drought. This hazard is of particular concern in Pennsylvania due to the presence of farms as well as water-dependent industries and recreation areas across the Commonwealth. A prolonged drought could severely impact these sectors of the local economy, as well as residents who depend on wells for drinking water and other personal uses. (National Drought Mitigation Center, 2006). The worst drought event on record in Pennsylvania occurred in 1963, when precipitation statewide averaged below normal for ten of twelve months. Drought emergency status led to widespread water use restrictions, and reservoirs dipped to record low levels. Although severe droughts have occurred in the 20th century, a more long-term look at past droughts, when climate conditions appear to have been similar to today, indicates that 20th century droughts do not represent the possible range of drought variability. Uncertainty regarding the future occurrence of droughts exists due to the potential impacts of climate change. Increased evapotranspiration due to higher temperatures is projected to create surface soil moisture deficits (Wehner et al. 2017) for much of the United States, but the likelihood for drought in Pennsylvania will decrease by the middle of the 21st century as months with above normal precipitation increase. 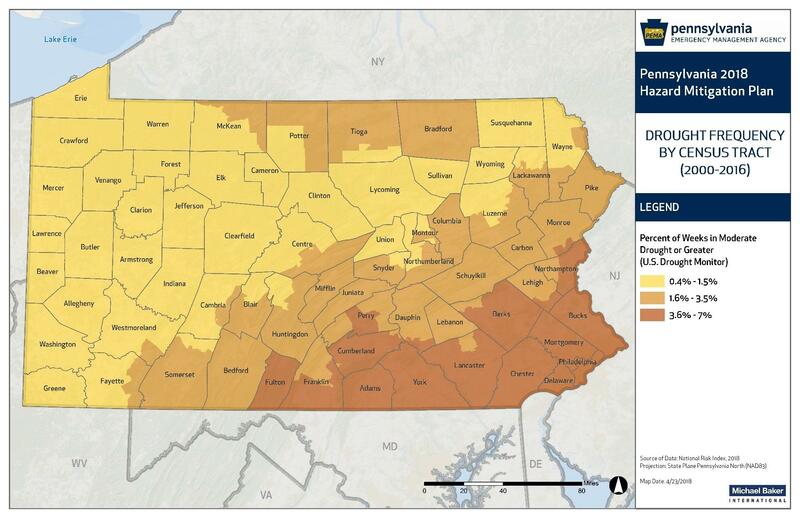 Number of emergency drought declarations in Pennsylvania by county between 1980 and 2016. Percent of weeks areas have been in moderate drought or greater.